Read an interesting interview with Serge Lutens in Osmoz. The photo depicts the new fragrance by Serge Lutens, Gris Clair…, a compositon of lavender, iris, tonka bean, amber and incense. Please see my review here. Also, in the same issue, there is an article on the profession of a perfumer. 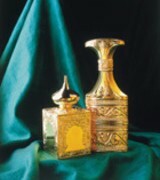 “But each perfumer also possesses his or her own ‘secret recipes’. At Guerlain, practically every single fragrance has the celebrated “guerlinade” (an accord composed essentially of powdery, vanilla and tonka bean notes) running through it like a filigree. In the same way, top perfumers like Alberto Morillas, Jean Claude Ellena, Christine Nagel and Annick Menardo have their own signatures, their own unique creative styles, their own sensitivity to the ingredients, their own ways of choosing and blending them. A delicate, personal, creative experience rich with emotion and personal history… ” Read the rest of the article. Halyna: Dear V, Thank you for this very interesting series of articles, especially the one about Serge Lutens. I just happened to glance at the author and she has the same first name as my DC (dear cousin and my original perfume muse) who recently passed. It was just nice to see her name, so thank you for that. parislondres: Thanks for this dear V! I enjoyed reading all the articles.